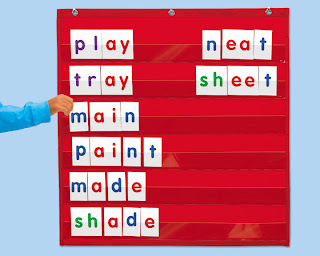 I love how this set covers every phonics skill, and has each one in a different color. Even if you don't point out that the vowels are red, and the digraphs are green, your child will still notice the differences and recognize them more as chunks which will help when blending. Stay tuned for Part #2 in which I will tell you how to teach beginning reading skills to your child using your word wall. *Thanks Norine for suggesting this post!